A council has been criticised after announcing apostrophes should not feature on its road signs. 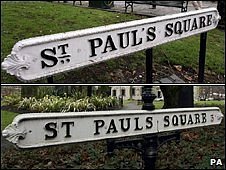 Birmingham City Council said it would cost too much to change signs referring to areas such as Kings Norton, Druids Heath and St Pauls Square. But it was accused of "dumbing down" by the Apostrophe Protection Society. Councillor Martin Mullaney said the authority had consulted with the Plain English Society and Plain Language Commission before taking its decision. He said on his blog: "We are constantly getting residents asking for apostrophes to be put back in and as a council we have got to make a decision one way or another. "From my perspective, I have done my own research into the use of the possessive apostrophe in place names. "Both the Plain English Society and the Plain Language Commission have said that there is no rule in Britain with regards to possessive apostrophes in place names." Possessive apostrophes on road signs started to disappear from the city's road signs in the 1950s, the council said. It said the decision had been taken in an effort to end decades of debate over the lack of punctuation on some signs. John Richards, the founder and chairman of the Apostrophe Protection Society, said: "It seems retrograde, dumbing down really. "It is setting a very bad example because teachers all over Birmingham are teaching their children punctuation and then they see road signs with apostrophes removed. "I think the council would be better advised to make sure the right apostrophes are in rather than removing them. "It's a bad example to children and teachers. It's a simple rule and so many people get it wrong."